Moreover, both parties provided grounds for these expectations. On the one hand, Russia’s consent to negotiate with Japan on the basis of the 1956 Declaration, under which it agreed to hand over two islands as a goodwill gesture in exchange for signing a peace treaty, is a considerable concession in its own right. 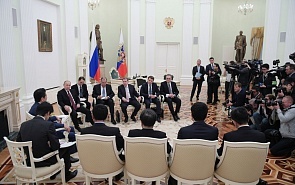 At the annual news conference in December 2018, President Vladimir Putin referred to a peace treaty with Japan and “cardinal solutions” on the islands as a likely prospect. This must have created false expectations in Tokyo, which interpreted these remarks as a signal that the “cardinal solutions” would be consummated and peace signed in January. More likely than not, Prime Minister Abe’s advisors jumped the gun following the dictates of the national political calendar: half of the National Diet’s upper chamber is to be re-elected in July. That the Japanese expected the Moscow summit to result in something much greater than it did is evident from the fact that the Abe team had been preparing the Japanese public opinion for a possible breakthrough. The assertions that Japan would not demand a monetary compensation from Russia or resettle Russian residents from the islands were primarily meant for Japanese domestic consumption. But they inevitably resurfaced in the Russian information space and raised a wave of indignation. Still more, they were taken as an insult. The latest Russian-Japanese summit brought back the everyday tonality to the discussion over the territorial issue after a surge of hype in the media and the public in both countries in December-January. This powerful public response forced the Russian authorities to soberly re-analyze the pros and cons of an accelerated signing of the peace treaty. Despite more frequent meetings of the Russian and Japanese leaders, the key bilateral problem of different strategic approaches to interstate relations remains unresolved. Tokyo believes that the Japanese leader’s outreach to Russia will lessen its isolation and enable Japan to obtain valuable territorial concessions in exchange for a few symbolic steps. Tokyo seems to think that it will be able to arrange for a rapprochement with Russia and induce Moscow to join the effort of containing China in Southeast Asia. However, Japan seeks to promote economic relations with Russia while keeping sanctions against it in place and avoiding Washington’s displeasure. Russia, for its part, wants much more from Japan. In its view, Japan should win strategic autonomy and be independent of the United States. It must also lift sanctions and work for a new quality of economic relations. Moscow holds up as an example its rapprochement with Beijing, a process that lasted for two decades and eventually made China Russia’s key trade partner and most trusted strategic interlocutor. In the longer term Russia would like to establish an inclusive political system in East Asia that would involve both China and Japan. And this is the main strategic controversy. Japan is a consistent US ally in both military and political respects. In 2018, when the Korean crisis came to a head again, Abe came out in support of using force against North Korea, whereas all other regional forces were in favor of restraint. Not so long ago, Tokyo vigorously backed US trade pressure and sanctions against China’s technological giants. It is hard to recall a situation where Tokyo would urge the US to display restraint or distanced itself from Washington’s more aggressive steps. The key issue for Russia is that the United States might want to set up military facilities on the Kuril Islands. There will be no decisions on the islands or a peace treaty as long as there is no clarity on this issue. To quote a recent remark made by President Putin, “We don’t understand the level of Japan’s sovereignty.” It is quite possible that Tokyo is bound hand and foot by US pressure and cannot afford making independent moves. But it could be that Japan itself is not against leading the way. Although there are current trade frictions between Tokyo and Washington, Japan has steadily supported sanctions against Russia and been evading an expansion of economic cooperation for fear of secondary sanctions. Despite recent positive dynamics in Russian-Japanese economic relations, a qualitative shift is yet to happen. After all, a peace treaty between Russia and Japan is not about events on the political calendar or a chance to score easy points ahead of the parliamentary election. It is about both countries’ strategic interests that will decide the fate of East Asia in the 21st century. Any haste is out of place here. The current configuration of relations leaves no room for a breakthrough.